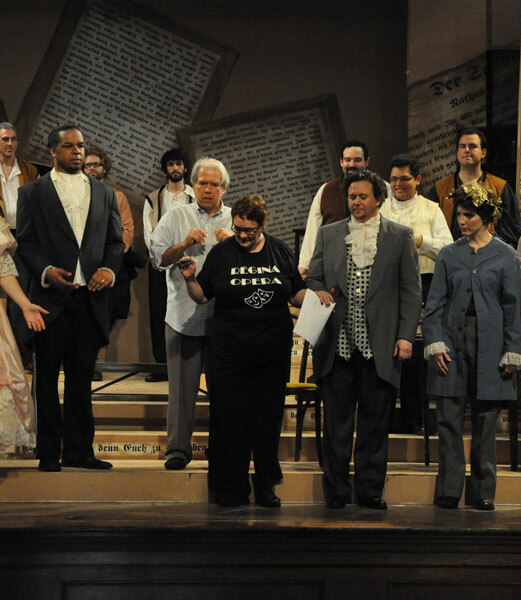 To bring great opera performances at reasonable prices to our Brooklyn neighborhoods. To provide a showcase for singers to perform the standard operatic repertoire, primarily in the original language, in fully-staged productions with orchestra and English supertitles. Founded in 1970 by Marie Cantoni and Nicholas Tierno, Regina Opera began as a small group of dedicated singers who gave opera recitals, with piano accompaniment, in a tiny auditorium at the Regina Pacis-St. Rosalia Parish Youth Center in Borough Park/Dyker Heights, Brooklyn. The following year, we produced an abridged staged version of La Traviata with piano accompaniment. In 1976, we began performing on the larger stage at Regina Hall (the auditorium of Regina Pacis School), and we acquired an orchestra in 1982. In 2008, a grant enabled us to begin providing supertitles. And in 2012, we moved to a wonderful new home, Our Lady of Perpetual Help School auditorium, whose more professional stage facilities and comfortable audience amenities inaugurated a great new era in Regina Opera’s history. Regina Opera Company, Inc., is a not-for-profit corporation organized under the New York State Not-for-Profit Corporation Law. It is tax-exempt under Section 501(c)(3) of the Internal Revenue Code, and all donations made to Regina Opera are tax-deductible for the donor.